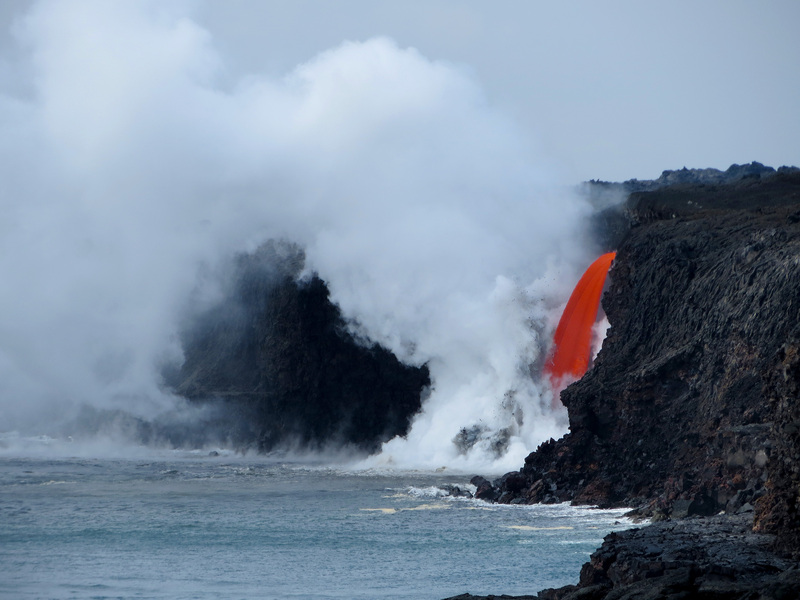 The Hawaiian Volcano Observatory (HVO) reports the active lava flow from Puʻu ʻŌʻō in the East Rift Zone is entering the ocean at Kamokuna located within Hawaii Volcanoes National Park. Additional surface flows are active near Puʻu ʻŌʻō and more recently moving beyond the National Park eastern boundary onto private property near the abandoned Royal Gardens subdivision. Bright incandescence is visible from the active lava flow field, and the lava flow does not pose a threat to any community at this time. Viewing area hours are from 3 p.m. to 9 p.m. daily, with the last car allowed to park at 9 p.m. It is about 8.5 miles round-trip from end of the pavement on Highway 130 to the ocean entry at Kamokuna and back. The flow can be seen starting from just beyond the parking lot all along the viewing area route. Restroom facilities are limited and lack running water. All members of your party should dress appropriately with boots or sturdy, covered shoes, long pants and a hat. Be prepared for rain, wind, sun, heat and dust exposure. Bring lots of water (1-2 liters per person), there is no potable water available. Bring a flashlight for walking at night. Our goal is to maintain public safety, protect the interests of Kalapana residents, and extend the use of the emergency road or Highway 130. We ask for your patience and kokua (help).